It's very important to travel outdoors, free your mind and connect with nature. We hope our curated trips and tips will help you plan your next great adventure. Last weekend Washington DC temperatures hit above 100 F and we decided to go swimming in Great Falls, 30 minutes away from the city. Great Falls Park is best know for its scenic overlooks but our favorite spot features a lagoon and a cascade where you can swim and escape from the crowds. Plus it's so close to the city that one can either bike or uber there. 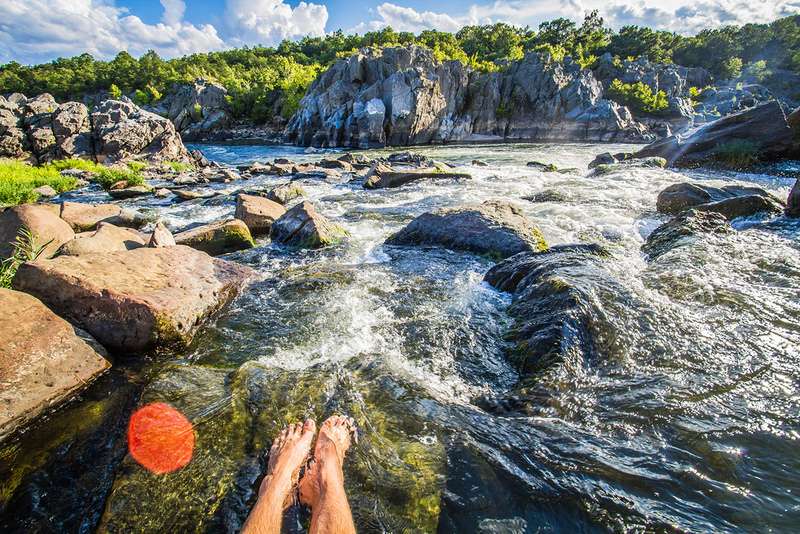 The place is formed by a Potomac river's branch on the Maryland side of Great Falls. Once you get there you'll see a lagoon surrounded by rocky walls. We've been many times at the place and it was never crowded. Enjoy sunbathing on the rocks and swimming at the lake. Rock scramble along the side of the lake and you'll get to the cascades, a spot to get some natural hydro massage while overlooking the Potomac river gorge: relaxing and romantic. Note: We are not sure about the water quality, but nothing ever happened to us after swimming here. We got at the place by 2pm and left right before sunset. Enough time to enjoy the water, the views and have picnic. We were most of the time alone. Sometimes some groups would come, swing by to see the place and go away. People would advise not to swim, but after 3 summers here we decided not to listen anymore. Especially at 100 F! Bugs are not a problem, but make sure to bring sunscreen, there are not many tree shadows to hide from the sun. This page BikeWashington will help you to bike from DC and surrounding areas (follow Maryland side). The Capital Crescent trail starts under the key bridge in Georgetown, leave to Chesapeake and Ohio towpath. It takes around 2 hours to get to the lagoon. Once there, the entrance to the 5 min trail that brings you down it's very close to the bridge and easy to find. What we did last weekend? We had fun in nature! This trip is featured on the book 20 Weekend Trips Close to Washington DC. on FB or IG for a chance to join us in our next adventure. Explore new outdoor places and plan your next adventure. Discover high-quality, design-inspired outdoor gear. Make your trips easier, cheaper and safer. Book: 20 Weekend Trips near D.C. Copyright © WHATWEDIDLASTWEEKEND | Travel Outdoors Cheap and Easy. All rights reserved.